For other uses, see Green slime (disambiguation). 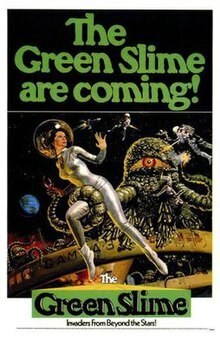 The Green Slime (ガンマー第3号 宇宙大作戦, Ganmā Daisan Gō: Uchū Daisakusen) is a 1968 science fiction film directed by Kinji Fukasaku and produced by Walter Manley and Ivan Reiner. It was written by William Finger, Tom Rowe and Charles Sinclair from a story by Reiner. The film was shot in Japan with a Japanese director and film crew, but with the non-Japanese starring cast of Robert Horton, Richard Jaeckel and Luciana Paluzzi. After destroying a huge asteroid that was on a rapid collision course with Earth, a group of astronauts discover they have accidentally returned to their space station with an alien slime creature that feeds on radiation and can reproduce rapidly from its own blood. A group of astronauts set out to blow up the asteroid Flora, which is now on a rapid collision course with the Earth. They land on the asteroid, plant explosive charges, and destroy it, barely escaping being destroyed by the explosion's massive shockwave. Afterwards, they return to the mission's staging area, space station Gamma 3, in high Earth orbit. Unfortunately, a scientist from the mission has unwittingly carried back a luminous-green substance on the leg of his spacesuit, which quickly mutates into one-eyed, tentacled monsters with the ability to discharge lethal bolts of electricity. The Gamma 3 crew fend off the alien creatures with their laser-based weaponry, only to discover the creatures feed off the laser energy which, in turn, allows them to multiply rapidly, sprouting even more one-eyed creatures from their own blood. As the creatures overrun the station, the crew continues to fight back against overwhelming odds. The proceedings are further complicated by a love triangle consisting of two commanders and a female doctor. The Green Slime was a co-production between Metro-Goldwyn-Mayer and Toei. MGM provided the funding and script while Toei provided the film crew and location to shoot the film. The original storyline for The Green Slime originated in Italy, where MGM also had dealings. Years before The Green Slime went into production, MGM had contracted Italian filmmaker Antonio Margheriti to direct what was originally intended to be a series of four television movies about the adventures of a space station called Gamma One. Margheriti's films in the series consisted of Wild, Wild Planet, War of the Planets, War Between the Planets and Snow Devils, all created over a period of three months and released in 1965. MGM was impressed with Margheriti's films and released the four films theatrically. Gamma One producers Manley and Reiner were eager to take advantage of these films and made The Green Slime as an unofficial fifth entry in the film series. The only connection the film had to Margheriti's films is the space station, retitled Gamma Three, which had a similar design as the one in Margheriti's films. Green Slime was shot in Japan with a predominantly Asian film crew and Caucasian actors. Aside from Horton, Jaeckel and Paluzzi, the rest of the cast consisted of amateur and semi-professional Caucasian actors living in Japan at the time. Yoshikazu Yamasawa was the cinematographer, and the film was edited by Osamu Tanaka. Toshiaki Tsushima composed the original score. Charles Fox re-scored much of the film for its release in United States, including the title song. The Green Slime was released in Japan in December 1968. The film premiered in the United States on December 1, 1968, and received a general release on May 21, 1969. The Japanese version of the film runs for 77 minutes in comparison to the 90-minute American version released by MGM, removing the arguments between Rankin and Elliot. The Japanese version of the film was released on DVD without English subtitles or dub in 2004. On October 26, 2010, the American version of the film was released on DVD as part of the Warner Archive Collection. On October 10. 2017, Warner released a high-definition Blu-ray version. Contemporary reviews of the film were mostly negative. Monthly Film Bulletin referred to the film as "junior league science fiction" that was "certainly schoolboy stuff". The review commented on the monsters in the film, stating that "the first appearance of the green slime looks promising, but the transformation of the lurid jelly into stock monsters is something of a let-down". Variety referred to the film as "a poor man's version of 2001", and described the story, script and special effects as "amateurish". The New York Times stated that the film "opens promisingly, keeps it up for about half an hour but then fades badly [...] the picture falls to pieces when the green menace becomes an army of rubbery-looking goblins". In a retrospective review, Stuart Galbraith IV discussed the film in his book Japanese Science Fiction, Fantasy and Horror Films, finding that Fukasaku's direction was "flat and uninteresting" and that the special effects by ex-Toho employees Yukio Manoda and Akira Watanabe were worse than their previous work with Eiji Tsuburaya, noting that the "miniatures are badly lit and lacking in detail". Galbraith commented that the film was "ultimately undone by some of the most laughably ridiculous monsters in screen history" and that "the film isn't bad until the critters show up". In Phil Hardy's book Science Fiction (1984), the film was described as "not a very convincing entry in the vegetable monster movie subgenre". On Rotten Tomatoes, the film holds an approval rating of 22% based on 9 reviews, with a weighted average rating of 4.9 out of 10. The Green Slime was used for the pilot episode of the film-mocking television series Mystery Science Theater 3000 in 1988 on KTMA. The episode differed from others as it lacked the character Tom Servo, instead featuring a puppet named Beeper who only spoke in beeps that Crow T. Robot could understand. ^ a b c d e f g h Galbraith IV 1994, p. 326. ^ a b c "Green Slime". American Film Institute. Retrieved December 10, 2015. ^ a b c d e f g h Player, Mark (July 7, 2014). "Intergalactic Tokusatsu: Charting the Japanese Space Opera, Part 2". Midnight Eye. Retrieved January 11, 2016. ^ a b c d Galbraith IV 1994, p. 172. ^ a b Galbraith IV, Stuart (December 2, 2010). "The Green Slime (Warner Bros. Archive Collection)". DVD Talk. Retrieved December 10, 2015. ^ a b Galbraith IV 1994, p. 327. ^ a b c Galbraith IV, Stuart (November 21, 2004). "The Green Slime (Ganmaa dai 3 go uchu dai sakusen) (Region 2)". DVD Talk. Retrieved December 10, 2015. ^ "The Green Slime". Monthly Film Bulletin. London: British Film Institute. 36 (420): 215. 1969. ^ Thompson, Howard (May 22, 1969). "The Green Slime (1968)". The New York Times. Retrieved December 10, 2015. ^ Galbraith IV 1994, p. 169. ^ Galbraith IV 1994, p. 171. ^ Hardy 1984, p. 272. ^ "The Green Slime (1969) - Rotten Tomatoes". Rotten Tomatoes.com. Rotten Tomatoes. Retrieved 24 October 2017. ^ a b Morgan 2015, p. 1. ^ a b Morgan 2015, p. 2. Morgan, Chris (2015). The Comic Galaxy of Mystery Science Theater 3000. McFarland. ISBN 1476618836.